Alertness for Strategic Opportunities: Hold These Three Attitudes – Tools for strategic and strong-minded thinkers! All though it is true that strategy involves some sort of premeditation, any experienced general knows that the plan will change with the first shots of battle. Opportunities will open up in unexpected places; so, strategic thinkers want to be alert – watchful, vigilant, and perceptive – for opportunities. 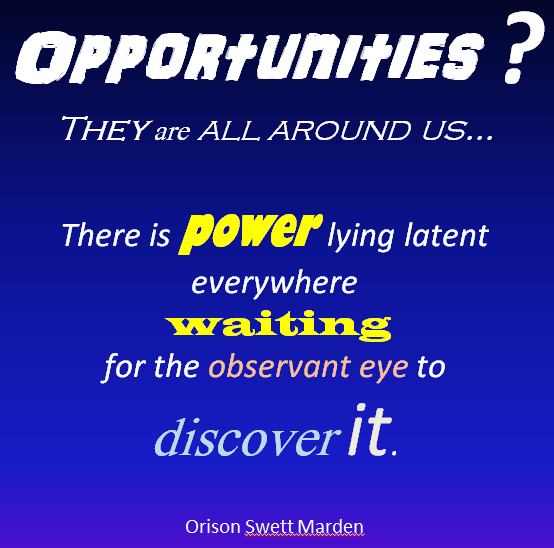 An opportunity is an event, observation, or option that has the potential to be favorable to someone. The word opportunity in Latin is a contraction of the words “ob” and “portus,” meaning facing in the direction of harbor. Picture yourself as a Roman seaman, sailing in from the treacherous sea, with the wind blowing you naturally into the harbor. This is passive opportunity recognition: sometimes opportunities happen on their own. Luck is a good thing! Accept the gift and move on. Entrepreneurs develop a sense of discovering, pursuing, and capitalizing on opportunities that lead to principled success. They are active in their thinking. Again, picture yourself as a Roman seaman entering a port filled with people who want to trade with you. Your short-term opportunity is to buy and sell. Your long-term opportunity is the recognition of patterns and development of business relationships. There are three attitudes that can help you be more alert to opportunities. Status quo situations are stable, predictable, and understandable. Although future can be these things, it can also be the opposite. You will be more likely to recognize opportunity if you assume your situation is characterized with these terms: dynamic, ill-structured, ambiguous, and unpredictable. Assume the situation is chaotic, and then ask yourself: where are the opportunities? Here we choose an assumption that we are blessed an abundance of creativity, talent, connections, ideas, technology, karma, and so forth. Admittedly it is optimistic, but holding an attitude of abundance doesn’t need to be seen as unrealistic. Here is a personal example: I don’t particularly like to prospect for new clients. However, I find that when I assume (imagine, visualize) that people will say, “I’m really glad you contacted me,” I find that I am more motivated to make the contacts. Sometimes the prospecting pays off handsomely! I see the opposite attitude frequently: the attitude of scarcity. The attitude of scarcity appears when a person assumes that there is finite and limited time, money, people, or resources. Here is one example of how it manifests itself. In my seminars, I often have an icebreaker game that involves designing a structure out of pipe cleaners where teams have to design and construct it in 10 minutes. When we debrief afterwards, participants typically note that the time limit restricted the quality of their design. My response to them is, “I would have given you more time if you would have asked for it. I also have more materials available and I would have given you more if you would have asked.” Their faces show amazement as they realize their scarcity assumption about time and resources has foreclosed on an opportunity. You will be more alert to opportunity if you hold an attitude of abundance. Your ability to see the imperfection shouldn’t blind you to the larger possibilities. In my venture capital firm, when we hire new, (typically younger people), into the business, we are accustomed to the newcomers hating every deal. They are smart enough to see the imperfection but not yet experienced enough to be confident accepting that the imperfection doesn’t define the opportunity. Endeavor to see the opportunity in spite of the imperfection of the current presentation. I suggest that you consciously use the word “plausible” as you evaluate the worthiness of an opportunity. This helps you make a nice conceptual fit with the 4Ps futures that I discussed in this article. As with any kind of strategic thinking, you will get better results if you are in a relaxed and playful state of mind. 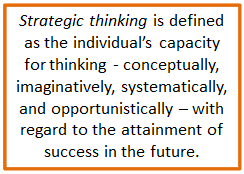 The right attitudes and mindset towards opportunity will make you a better strategic thinker. In addition to these three attitudes, what mindsets will help you?